The place is close to some restaurants, and McDonalds's is in the same building. The subway is walking distance (around 10 mins). One of the six rooms I tried was tolerable. Washer-dryer also worked in one of the rooms. Location was ok.Macdonalds KFC Pizzahut just below Building. Nearest metro station is 10 mins walk. Just checkout girl in the morning was nice,she called taxi for me as it was raining and cud the use metro. Being a Muslim you can use the bath shower,and make the pipe as Muslim shower by connecting it with a tap next to toilet seat. The room was large and quiet. There was a washing machine with dryer in the unit. The room was spacious and clean. location was good. people at reception were helpful. Good courteous staff. They try to help in everything. Many people speak English fluently. Special thanks to Lin, speaks excellent English, kind and sympathetic girl. The room is clean, cleaned regularly. Good location, around a lot of shops and different cafes. Clean, green area. Clean, comfortable room. There's a washing machine in the room. You have to buy your own detergent though. The appartment itselft is really nice, modern and clean. It is close to the subway and to a lot of shops and restaurants. One of our best sellers in Hangzhou! 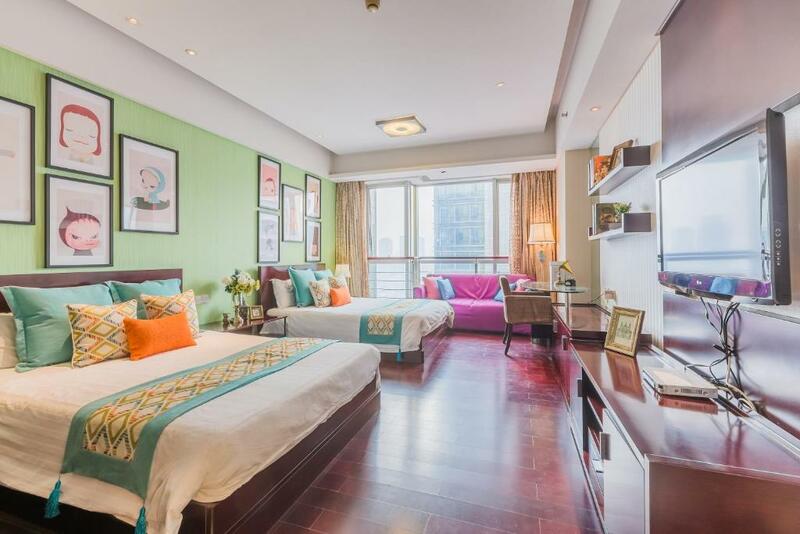 Binjiang Seven Service Apartment is located at Xinguang Avenue, the biggest Commercial Street in Hangzhou. It features rooms with flat-screen TVs and free internet. 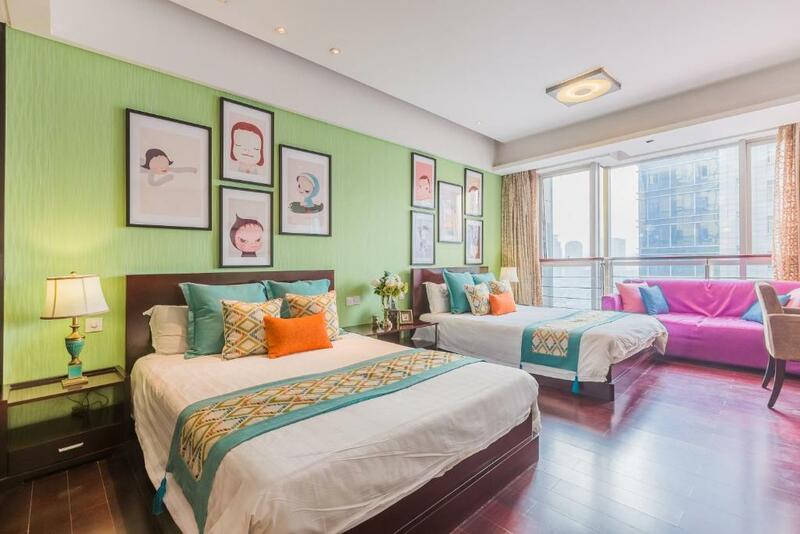 Binjiang Seven Service Apartment is 17 miles from Hangzhou International Airport. 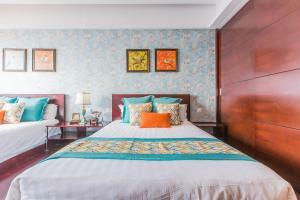 Each room has a well-equipped kitchenette and private bathrooms. The kitchenette includes a washing machine, dryer and stove. 24-hour room service is available. Guests can make ticket reservations at the tour desk. Binjiang is a great choice for travelers interested in food, sightseeing and tourist attractions. 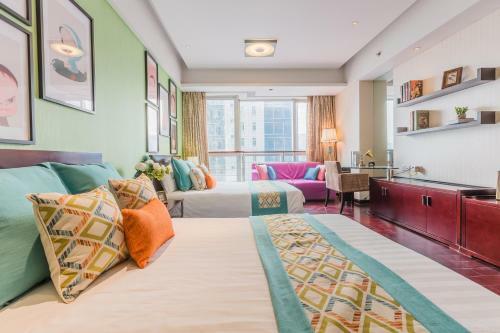 When would you like to stay at Binjiang Starlight Public Pavilion Hotel Apartment? Suite is 70 square yards and comes with ironing facilities, a flat-screen TV and a kitchenette with microwave, fridge and dining area. Features a living room and a bathtub. Public parking is available on site (reservation is not needed) and costs CNY 5 per hour. 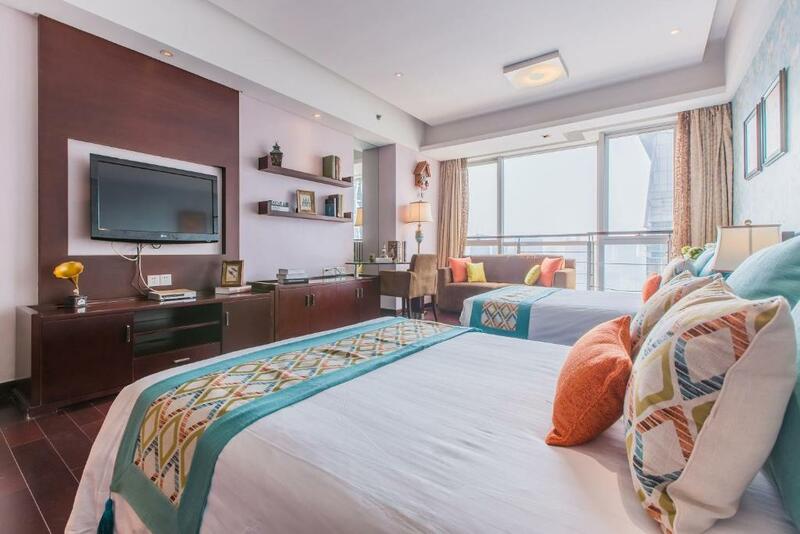 Featuring river views, the room is 580 ft² and includes ironing facilities, a flat-screen TV and a kitchenette with a microwave, fridge and dining area. Room is 54 square yards and comes with ironing facilities, a flat-screen TV and a kitchenette with microwave, fridge and dining area. House Rules Binjiang Starlight Public Pavilion Hotel Apartment takes special requests – add in the next step! 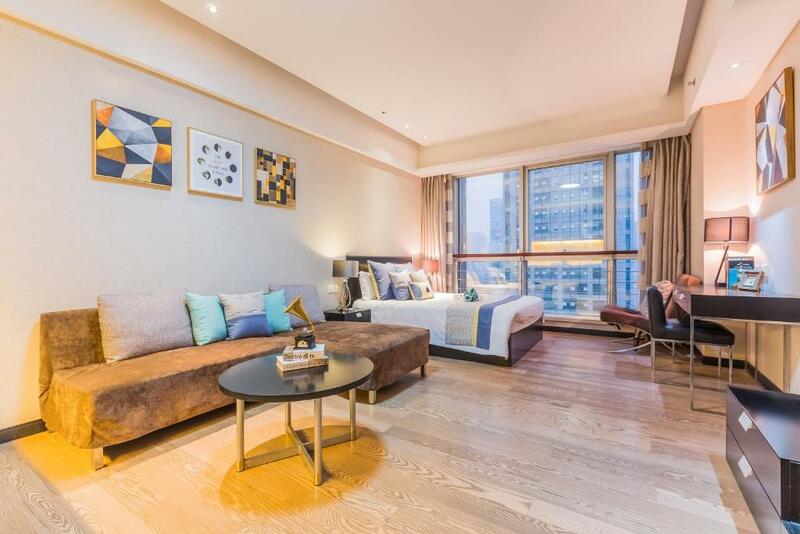 Binjiang Starlight Public Pavilion Hotel Apartment accepts these cards and reserves the right to temporarily hold an amount prior to arrival. Please note that the front desk is located in Room 805 on the 8th floor. 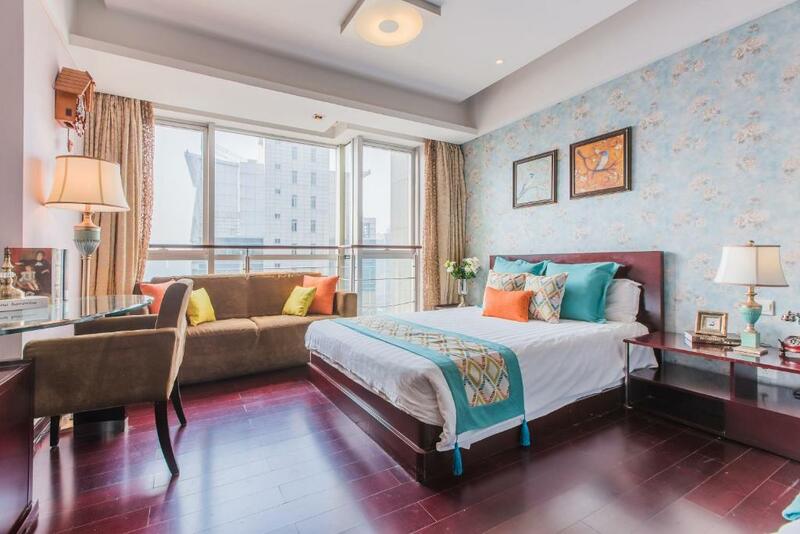 Please inform Binjiang Starlight Public Pavilion Hotel Apartment of your expected arrival time in advance. You can use the Special Requests box when booking, or contact the property directly using the contact details in your confirmation. Shower time just some minutes, than reheat water for hours. I booked the apartment with kitchenware, however, at our arrival, there were not kitchenware at all. As I asked the ladies at the reception for this, one of them told me that there is kitchen. I had to show her that on the booking confirmation, it is mentioned “kitchen” and “kitchenware” and not just kitchen. She started telling me that I had to write an Email to booking etc etc. However I insisted that the kitchenware was mentioned in the description of the apartment and in the booking confirmation, that I paid for it and that I wanted to have it immediately. A couple of minutes later they brought a couple of plates etc to our apartment. Apart from that, the apartment was really nice clean and really nothing to complain about. It would have been better if the kitchen had few simple basic utensils. I got a camera with a river view that I never got to see! The a/c did not work at all in hot air mode, bed was extremely uncomfortable. For the same price you can find much better solutions. Only one of the staff can speak English. I inquired at the building lobby about the hotel, and it took a while before I understood that the hotel's reception is on the 8th floor, not at the building lobby. The hallway is dim at night, too. Completely inconsistent quality. Most rooms were garbage. One stank of urine, three stank of cigarette smoke, every room had something broken, and the location isn't secure. Someone followed me back to my room in a hallway that wasn't even lit. Sometimes you wait 15 minutes for an elevator. Many rooms are loud because they overlook the loudest area of the mall (concerts, etc.). Fire doors marked "keep closed" were always locked open. Awful. Tried here a few times. The beds were uncomfortable, one room was so smokey I had to switch rooms, one of the rooms had broken AC, and one smelled so strongly of urine that my clothes stank for a week after I left. The AC also barely works even in the better rooms, and if you do get it to finally start building up some cool, the cleaning people turn it off and you have to start over. Plus, if you're on a lower floor, the noise from the mall and streets is sometimes overwhelming. And they lied about the kitchenware. Horribly unpredictable quality. You might get lucky, but it's not worth it. Definitely not going back. NOT recommended. The room has a kitchen, but there is absolutely no utensils and cooking utensils for cooking. 1.These Are not Apartments.Everything is a mess.No Cutlery ,No Toaster,just a Microwave and a small useless mini fridge.Stove doesn't work. 2.Staff I Dint like at all,I asked for some water bottles,she charged me 3 Yuan per bottle,when it should be complementary,at least at Checkin. 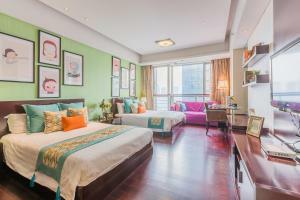 3.they take Rmb 600 deposit and Return it on credit card on checkout(I hope it comes to my card) 4.Like all Other Apartments in china ,Their office is on 8th floor Room no 805.So dnt look for Receptions .come straight to building 3,room 805.and keep local address in Chinese ,otherwise it will be a big problem.Use SIM card Mobile Data 4Gb (160 Rmb) from Airport.without mobile data and VPN (as it allows google) china can be a night mare. Use google translate to communicate with staff and others because they barely speak English. 5.There ar no plates ,not a single spoon or knife,when I asked Cutlery,the staff smile back,telling me ,Many restaurants downstairs,so eat their. 6.They should at least give good reception and guide proper facilities on booking.com,otherwise they will lose customers fast. 7.This place only good ,if you want to sleep at night. 8.Bathroom also shabby,just have live with it guys.This property not well maintained at all.